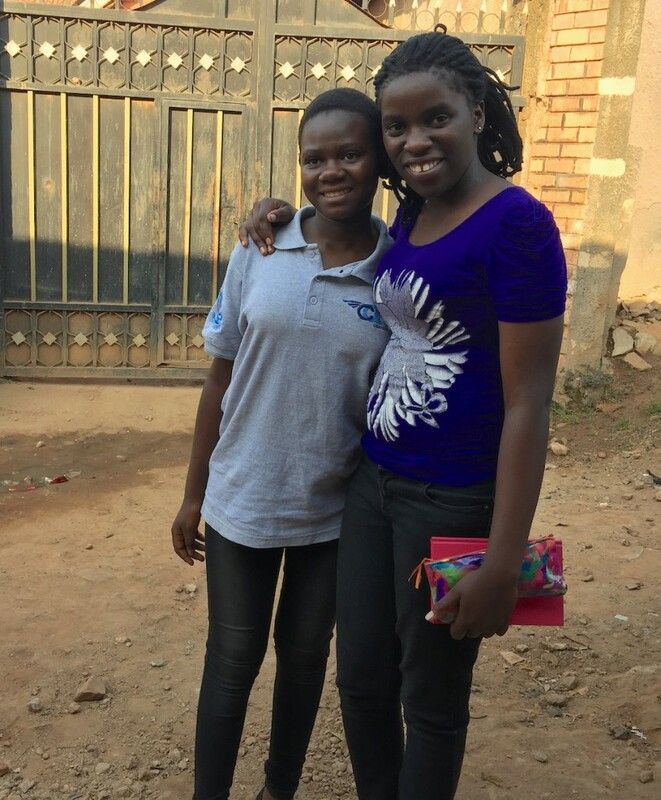 Gloria and Phiona are role models in Uganda, an inspiration to many young players, especially the young chessplayers back in Gulu who speak of them fondly and aspire to be like them. Phiona is the “Queen of Katwe” in the upcoming Disney movie, which was inspired by her life. Gloria will be representing Uganda in the upcoming FIDE World Youth and Cadet Championship which takes place in Greece from Oct. 24 – Nov. 6, 2015. 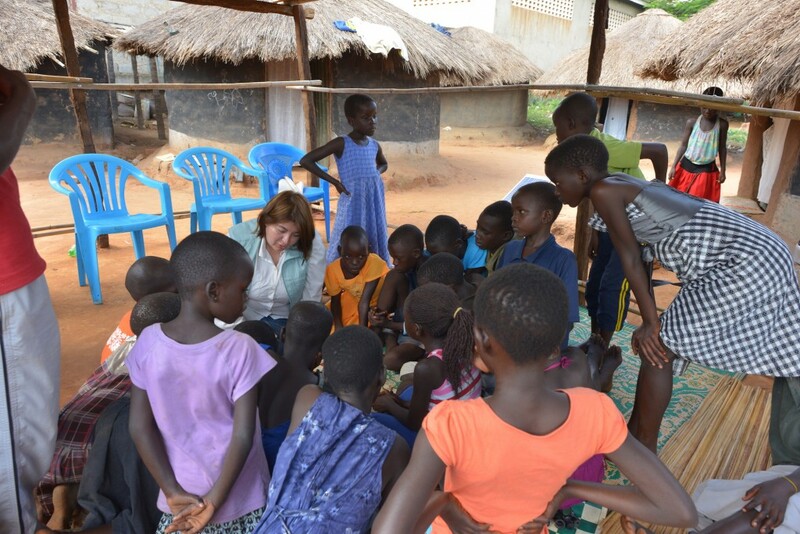 The “Smart Girl Project” is a program created by SAC Chair, Beatriz Marinello, in light of the need in rural Uganda. The project receives support from the Social Action Commission that has helped support the growing program. 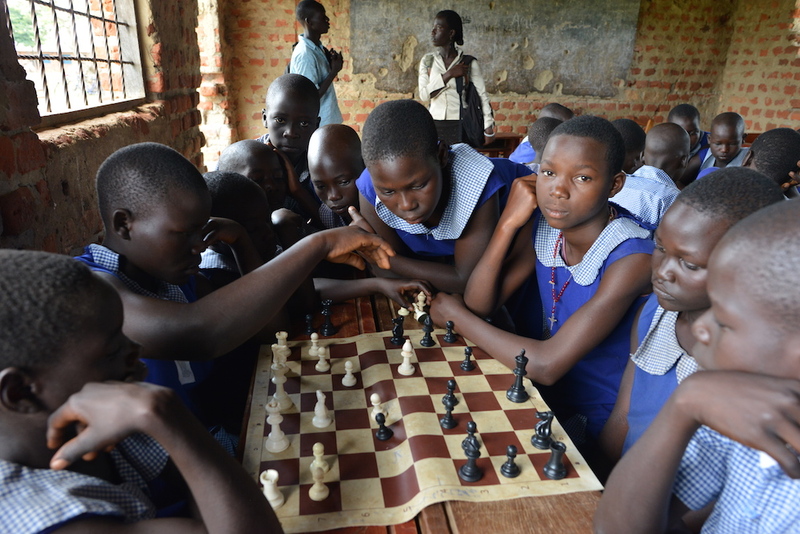 Chess classes were already taking place in Uganda and were struggling due to scarce funds for a chess programs and practically no chess equipment. 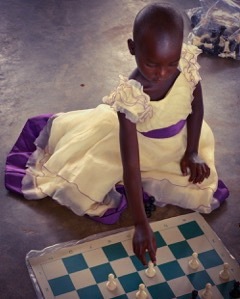 The creation of the “Smart Girl Chess Program” and it’s pilot programs in Uganda have been a blessing. With the support of SAC and Sports Outreach and the efforts of our Chair Beatriz Marinello and General Secretary Robert Katende, we have been able to develop a “Smart Girl Chess Program” in five centers for children who live in extreme poverty conditions. Our Chair has even helped secure donations of equipment as well as other support from other organizations, such as the Marshall Chess Club. The Marshall Chess Club donated a large amount of chess sets and clocks for the program in Gulu, equipment that the SAC Chair delivered to the children and centers personally. 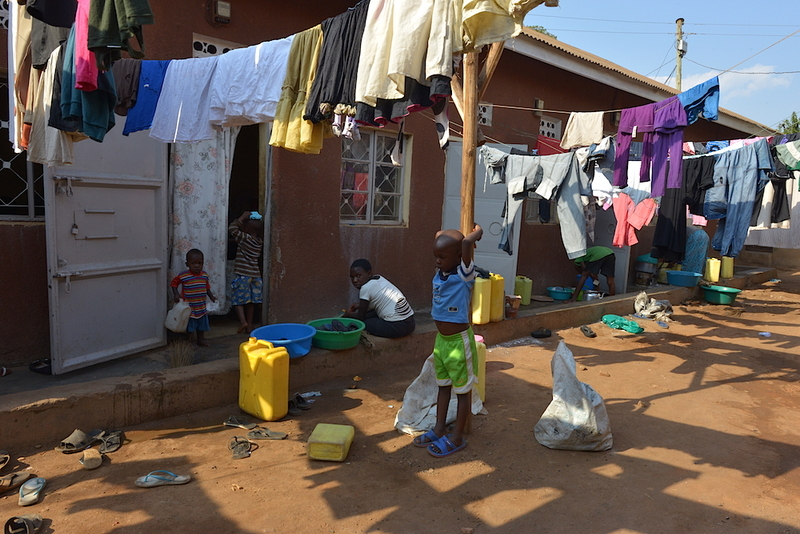 Gulu is a city in Northern Uganda that was impacted by war. Most people live from agriculture in conditions that are below the poverty line. There is no electricity or running water, however, efforts from the government and non-profit organizations such as “Sports Outreach” have made access to water possible by constructing wells within communities. Women and children are often the only ones seen walking long distances to carry much needed water back home; the water is transported in plastic jugs carefully balanced on their heads. The beautiful children of Gulu opened their hearts to chess and we are hoping that through this initiative we can empower them to embrace education and good decision making skills. The only way that we can transform these children’s lives is by providing educational and social programs. 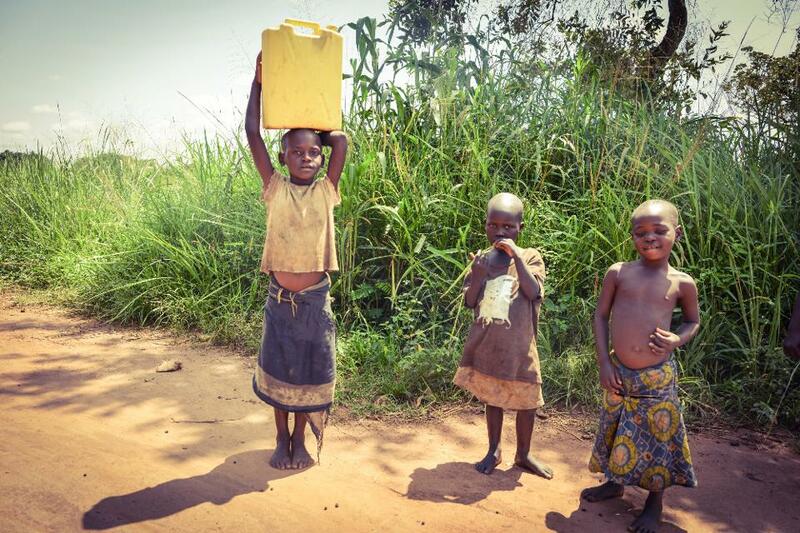 In Uganda education can be costly for people who are struggling to feed their families. Above the 6th grade level, education needs to be paid for; we want to give these children a chance by connecting them with people who can help pay for their education. The Social Action Commission and Beatriz Marinello would like to reach out to people with good hearts from around the world that are willing to help sponsor a child who desperately needs help to pay for their education and boarding schools. 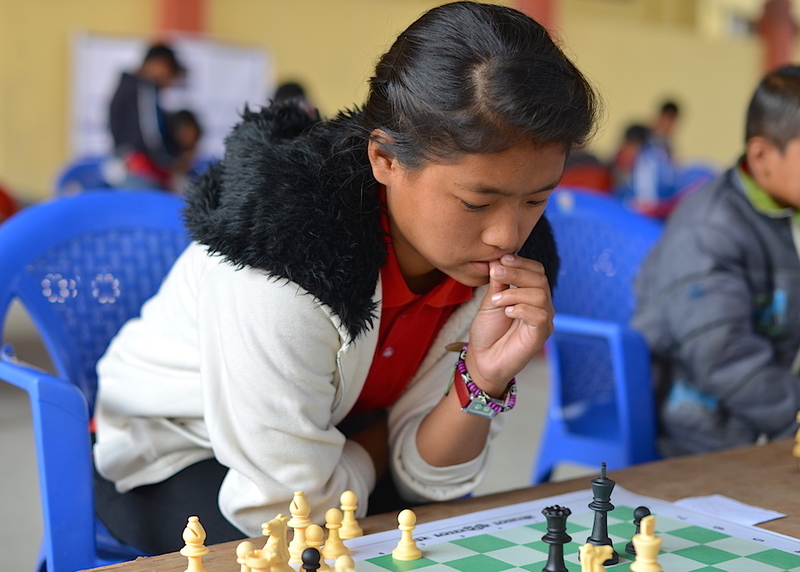 We met one young girl in the ‘Smart Girl’ Program who was no longer in school because her family could no longer afford the school’s fee, however, she never missed her chess class. After traveling 14 hours by car, Beatriz insisted on visiting the kids despite the long hours traveling. If the children were waiting for her, she was not going to let them down. 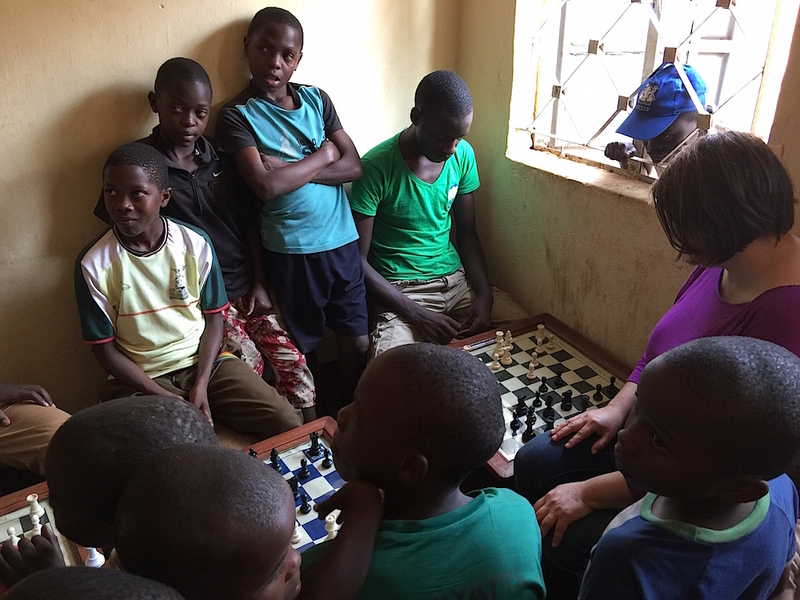 Beatriz Marinello and Robert Katende, speak with the mothers of girls in the “Smart Girl” program about their progress in chess and tournament participation. 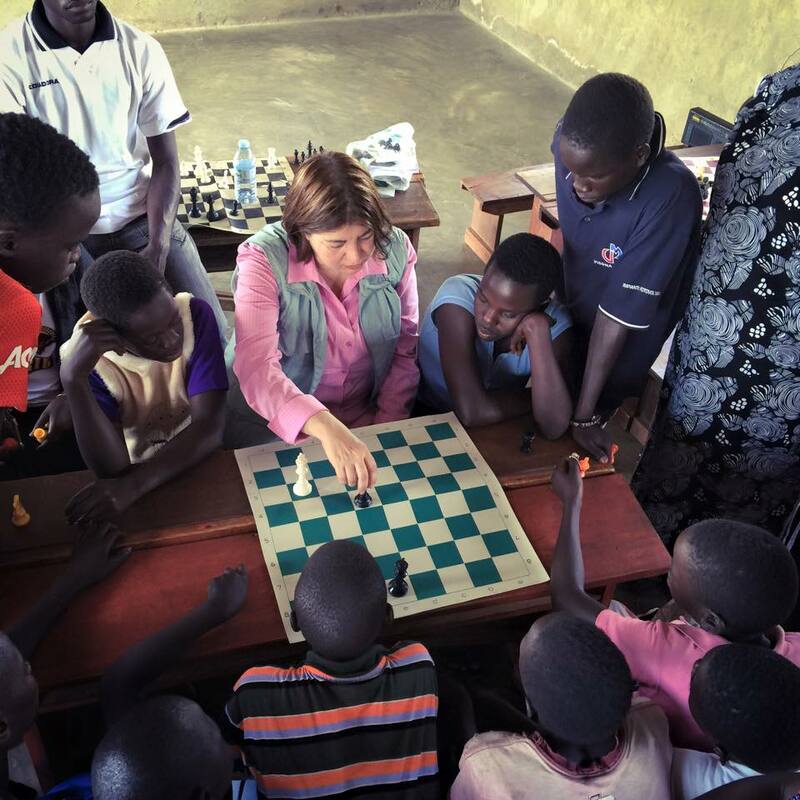 Beatriz goes over game strategy with the young chessplayers in Kampala, some of whom are already playing in National Tournaments despite their challenges. 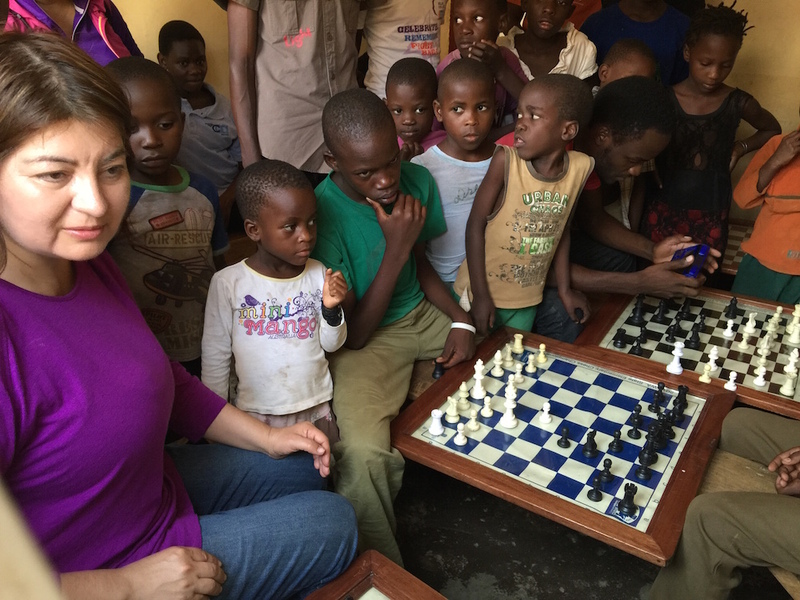 We arrived at the Chess Academy in the heart of the slums in Kampala. 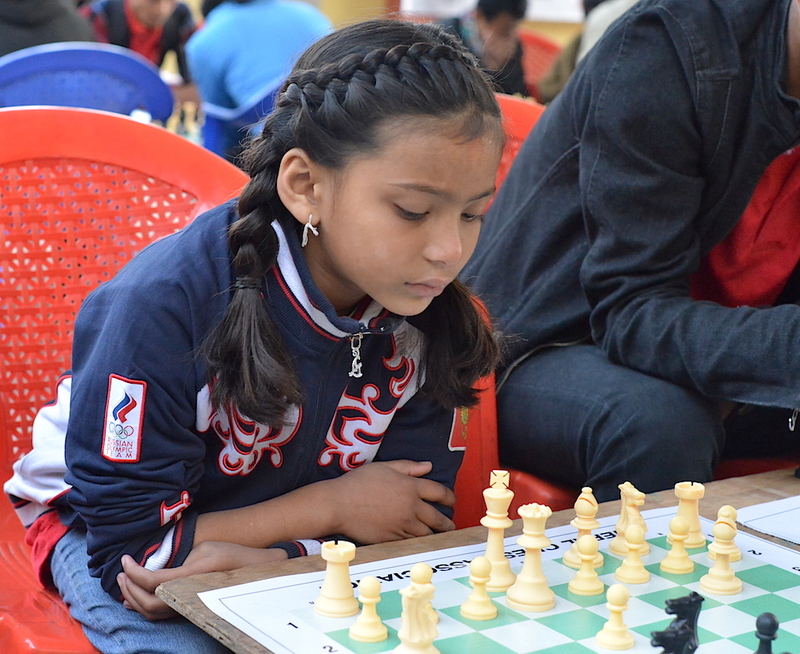 Resources are scarce, but, that doesn’t stop young chess players from focusing on their game. At times many players spend 5 hours a day at the Academy; it has become a safe haven for the kids. Shown below is Richard, playing a game with Beatriz. Richard is a tall and talented 14 year old player, unbeknownst to him, he is playing the game of his life. He doesn’t know it yet, but, Beatriz Marinello has personally agreed to sponsor him and pay for the cost of 4 years of school for him. The children used to share chess sets or take turns in order to play due to the lack of equipment. We are pleased that this is no longer the case. Apart from the sets the Social Action Commission gave the centers, our Chairperson facilitated a donation of 54 sets from the Marshall Chess Club in New York City and personally delivered them to the children. The children were very happy when Beatriz read the letter the club sent them. Thank you Marshall Chess Club! The Chilean Ministry of Social Development and the World Chess Federation (FIDE) signed the Social Initiative Chess Agreement to facilitate the integration of children, youth and vulnerable senior citizens through the game of chess. The aim is to promote strategic thinking and intergenerational exchange in vulnerable sectors. The FIDE Social Action Commission Chair, Beatriz Marinello, helped facilitate the relations between the World Chess Federation and the Government of Chile to make this historic agreement possible. It is through initiatives like this that the Social Action Commission is helping make a difference across the world, from its projects in Africa, Chile, Trinidad and Tobago and Nepal. In forming strong and positive relationships, we can all make a difference in the communities across the globe. The alliance was sealed in the presence of World Chess Federation Vice President and Chair of the FIDE Social Action Commission, Beatriz Marinello; Minister of Social Development, Marcos Barraza; the Superintendent of the Metropolitan Region, Claudio Orrego; General Secretary of Social Services, Juan Eduardo Faúndez; Executive Director of FOSIS, Andrés Santander; National Director of SENAMA, Rayen English; INJUV National Director of SEREMI Nicolas Preuss; and Social Development Director of the Metropolitan Region, María Eugenia Fernández. With the signing of this agreement pilot chess programs will be implemented in the regions of Valparaíso, Tarapacá, and Los Lagos, with nine communities in total, for about eight months, with an investment of approximately $85.000 US dollars. With this project, the Ministry, through the Solidarity and Social Investment Fund FOSIS; the National Service for Senior Citizens, SENAMA; and the National Youth Institute, INJUV, seeks to strengthen the social fabric of communities and create opportunities for encounter through chess, that can strengthen the dialogue between generations. To mark this event, officials and about 30 participants, seniors, youth and children, participated in a game of human chess, at the Plaza of the Constitution. The project aims to promote active aging in senior citizens through interaction during chess play with others; for children it is a practice that strengthens their ability to develop strategies; while for the youth, it increases active participation, solidarity and commitment to their community. We’re interacting with many other FIDE commissions, including Chess in the Schools, Events, Women’s, Disabled, and Trainers Commissions. We welcome collaborations with other International Organizations that share similar goals. The following seminars are connected to the Chilean government in conjunction with the Ministry of Social Development. In Chile, three FIDE Trainers Seminars were held in: Santiago, Concepcion and Iquique. GM and Senior Trainer Reinaldo Vera was the Lecturer and the Assistant Lecturer was WIM and FIDE Trainer Beatriz Marinello. In order to develop chess we need to reach out to the local community and provide them with skills and the motivation needed to support the creation of new programs and existing programs. Therefore, it makes sense to include Seminars that offer training for Trainers and Organizers. The Ugandan Chess Federation in conjunction with FIDE, hosted two important events, an International Organizers Seminar and FIDE Trainer’s Seminar. The events took place from August 28th to 31st 2015 Kampala, Uganda. The seminars attracted over 30 participants from Sierra Leone, Uganda, Kenya, Rwanda and Burundi. This is the first time that these two types of seminars are held in East Africa and presented an opportunity for participants to acquire skills related to organizing high level events as well as nurturing and developing chess talent. The seminars started with a brief opening ceremony at which several of the leading local press were represented. 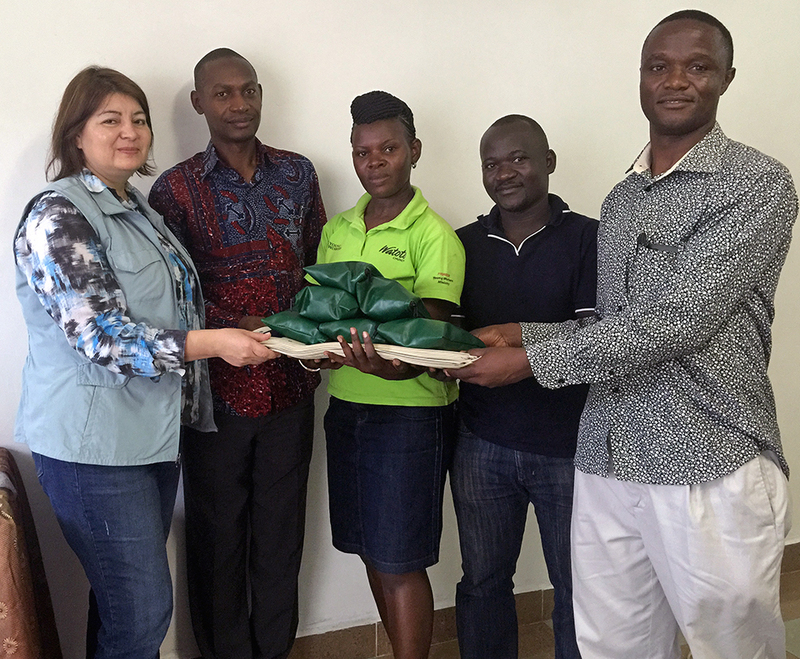 Beatriz Marinello awards a gift from the Marshall Chess Club in New York City for the children of Uganda who participate in tournament play. Notable among the participants are President of Burundi Chess Federation (FECHEBU) FA Deo Ntagasigumwami, Vice President of Uganda Chess Federation Olga Robinah Namwanje and leading Kenyan players CM Ben Magana and DI Andiwo Moses. 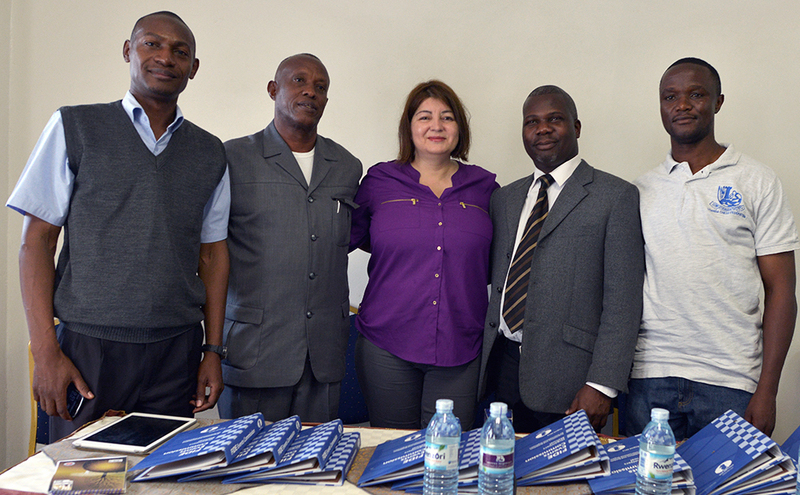 The seminars were conducted by FIDE Vice President Beatriz Marinello who is also the Chairperson of the FIDE Social Action Commission and coordinated by Social Action Commission General Secretary Robert Katende. Participants attended the seminars free of charge, a sign that FIDE is focussed on growing capacity of chess organization and training in Africa. Beatriz also visited Social Action Commission supported projects in Gulu, Uganda from the 24th to 27th of August 2015. During her visits to the centers in Gulu, Beatriz distributed a total of 47 chess sets to the 5 centers in Gulu whose children participate in the “Smart Girl Project” and 7 sets with 5 extra boards were given to the Uganda Chess Federation for the children to use in tournament play, these were received by the UCF Director of Development – Robert Katende, Technical Director – Stephen Kisuze and Vice President of Uganda Chess Federation Olga Robinah Namwanje. 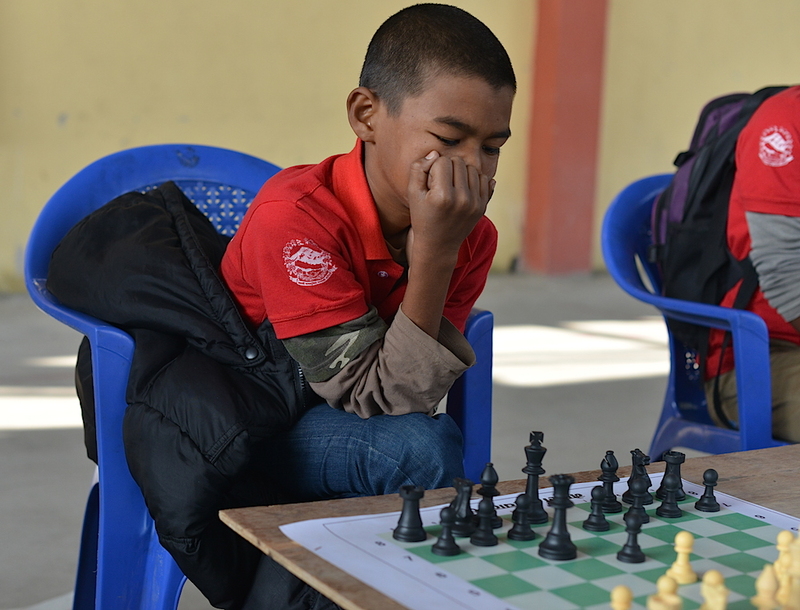 The first chess tournament for children residing in orphanages and group homes was hosted in Kathmandu, Nepal in November 2014. The Social Action Commission is happy to have helped fund this event. Our Chair, Beatriz Marinello, met with the Minister of Sports and discussed the collaborative efforts being made to reach out to the children in orphanages and group homes. Organizing tournaments such as these gives the children an opportunity to participate in events that are normally closed to them. Beatriz attended the Opening Ceremony and the tournament. During her visit to Nepal, Beatriz also visited many orphanages. The great need that exists in Nepal is painfully obvious. Visits to the Group Homes were both moving and revealing. The general feeling among the children, despite their difficult struggles for ones so young were optimistic. Little did we know that not long after this chess tournament, the country would be hit by a devastating earthquake. 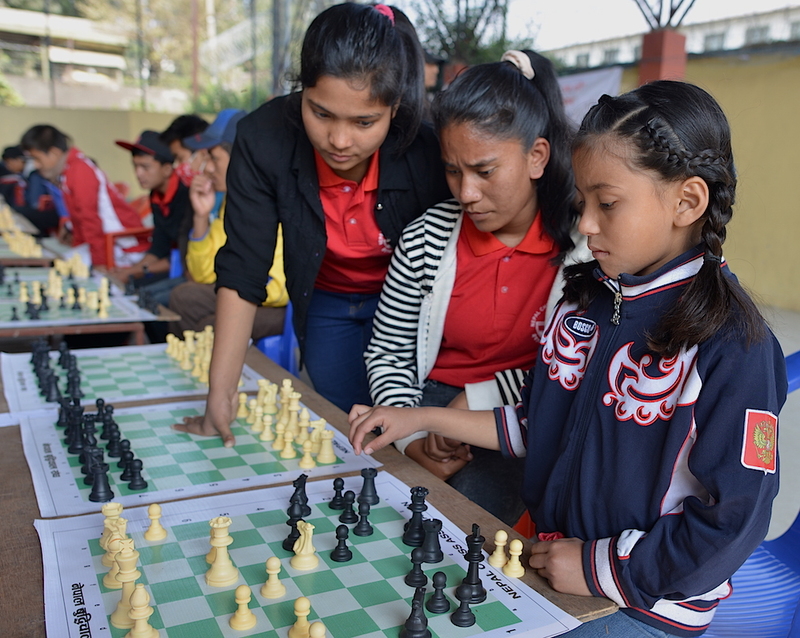 Young girls participate in the first chess tournament for children in group homes and orphanages. The children of Nepal must face more challenges. With help from many countries, Nepal is on the road to recovery. Our thoughts are with the Nepalese as they work hard to rebuild the destruction left by the earthquake. A young boy participates in the first chess tournament for children in group homes and orphanages. The Social Action Commission shall promote the use of chess as an equalizer, especially in the areas of women’s equality and bridging the gap between the social and economic differences that impact people across the world. The Social Action Commission shall promote the use of chess as an aid for persons at risk from dementia, Alzheimer’s disease and other mental illnesses particularly among seniors. Overall, this commission should deal with issues related with brain aging. The Social Action Commission shall promote measures that utilize chess to help children at risk. The Social Action Commission shall liaise with other organizations that have similar objectives. We are happy to report that the commission’s projects have created a positive impact in the targeted communities. We will continue to our work, adding new Federations that want to develop programs for chess as a tool for social improvement. All Photos by Dora Leticia, Copyright Protected, except as indicated below. Photos for Chile section of report are courtesy of the Chilean Chess Federation and subject to their Copyright.
. I am very pleased to know what is happening in the Commission and my experience in Eastern Uganda is trying to improve the learning experience and improve their reading abilities. Uganda for the last few years introduced Universal Primary Education (UPE) where children of school going ages to not pay tuition fees, which is met by the government. This has increased school intake and resulted in too many children per class. Not enough attention is paid to children and as a result many children pass through the primary school without learning to read properly. this where I am trying to improve. the children health and hygiene I also wish to address. i am collaborating with a retired judge and a chairman of the Board of Achilet Primary School four miles west of Tororo Municipality, in Eastern Uganda.
. I am very pleased to know what is happening in the Commission and my experience in Eastern Uganda is trying to improve the learning experience and improve their reading abilities. Uganda for the last few years introduced Universal Primary Education (UPE) where children of school going ages to not pay tuition fees, which is met by the government. This has increased school intake and resulted in too many children per class. Not enough attention is paid to children and as a result many children pass through the primary school without learning to read properly. This is where I am trying to improve. The children health and hygiene I also another area I wish to address. i am collaborating with a retired judge and a chairman of the Board of Achilet Primary School four miles west of Tororo Municipality, in Eastern Uganda.